Með þessari dokku má tengja harða diska og SSD diska beint við tölvu án þess að vesenast með skrúfur og/eða opna tölvukassa. Þessi dokka kemur með innbyggðu USB 3.0 tengi en virkar einnig fyrir USB 2.0 og USB 1.1. 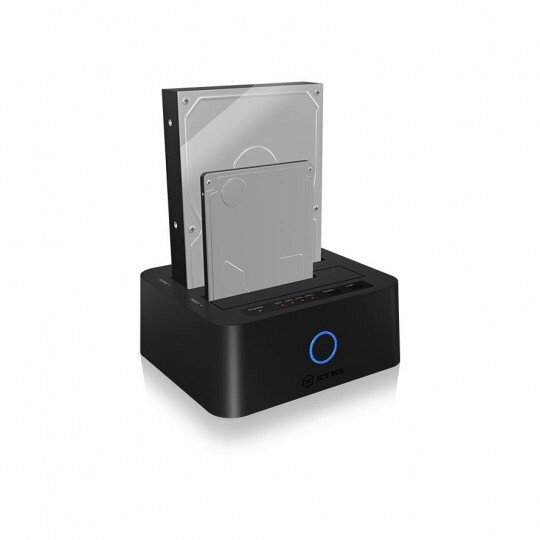 * The IB-123CL-U3 offers space for two 3.5 "and 2.5" hard drives or SSDs. So can you write or read them at the same time which can save a significant amount of time. The hard disk capacity is unlimited. * Basically, this statement only means that this function is maintained when the docking station is separated from the PC. The disks are then cloned without PC connection. The power cord should still remain connected though. * Seven colored LEDs inform the user about the status of the cloning operation, and the hard drives at any time. If nothing is being cloned, the USB 3.0 Standard can reach transfer rates of up to 5 Gbit/s. The hard drives are detected and displayed independently. Expansion Bays 1 x top accessible - 2.5" ¦ 1 x top accessible - 3.5"